You can expect Miguel Cotto to KO Sadam Ali with a right hand tonight, according to trainer Freddie Roach. He says he’s scouted Ali’s recent 9th round knockout loss to Jessie Vargas from 2016, and noticed that he was vulnerable to the right hand. Roach has had Cotto (41-5, 33 KOs) working on his right hand during tis training camp to get ready to use it tonight against Ali (25-1, 14 KOs) in their fight at Madison Square Garden in New York. Roach sees this fight as a must-win situation for the 37-year-old Cotto, since he doesn’t want him to retire off a loss to Sadam Ali. Roach says he won’t allow that to happen. “Somebody said he needs to be more of a right-handed fighter, and throw his right hand more, because he’s too well-known for just a hook,” said Roach to Fighthype about Cotto being overly reliant on his left hook. “To me, the hook was so good, nobody could stop it. So, I brought that hook back, yes, and the straight right back. With this opponent, the straight right hand is going to be an effective weapon for us in his fight, because this guy is right there in front of us. The hook will be there for the body, and we will break him down,” said Roach. Cotto was already using his right hand long before Roach joined up. It’s hard to understand where Roach is coming from in him saying he’s getting Cotto to use his right hand more. In addition to taking credit for Cotto using his right hand more, Roach seems to be also taking credit for bringing back Cotto’s left hook after he started training him 4 years ago. The reality is, Cotto never stopped using his left hook. The reason why Cotto didn’t use it in his 2 previous fights before joining up with Roach in defeats against Floyd Mayweather Jr. and Austin Trout is because those guys didn’t let him use that weapon. Mayweather and Trout fought Cotto on the outside, making his left hook useless. When Roach took over as Cotto’s trainer, he made a big deal about how he was bringing back his left hook. The truth is, Cotto never stopped using it. He just couldn’t use that weapon against Mayweather and Trout, because they nullified it. “I do think we’ll knock him out in the late rounds, because Sadam Ali is a right fighter,” said Roach. “He’s an Olympian. I think he’s a good fighter. He has one loss as a pro. Jessie Vargas, I believe, knocked him out. That gives me a great game plan in how to work, and he got knocked out with a right hand in that fight,” said Roach. Let’s face it. Cotto would probably knockout Ali no matter who is training him for this fight. We’re talking about a hand-picked opponent that was recently knocked out by Jessie Vargas. Where Cotto would need great training is if he were fighting Saul Canelo Alvarez or Gennady Golovkin. In that case, it would make sense for Roach to make a big production about him bringing back Cotto’s right hand or left hook, because he would need both to keep from getting massacred. “We have to win this fight though,” said Roach about the Cotto-Ali fight. “Who wants to retire on a loss? We’re in a must-win situation, and that’s where we’re taking it. We trained as hard for this fight than any fight,” said Roach. 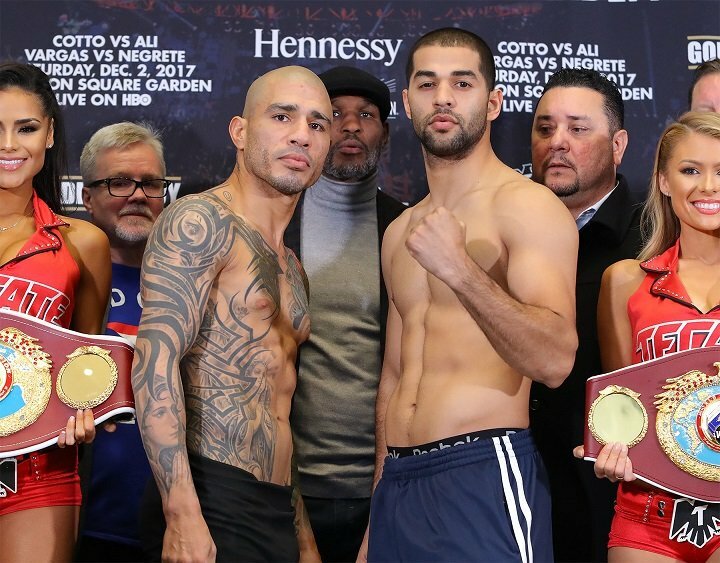 By choosing Sadam Ali as his last opponent instead of a good fighter from the 154 or 160-pound divisions, it’s put Cotto in a must win situation. If Cotto loses to the likes of Sadam Ali, he’ll take heaps of criticism from boxing fans. In contrast, losing to fighters like Canelo, Golovkin or Jermell Charlo isn’t nearly as bad. Tonight’s Cotto vs. Ali fight can be seen by boxing fans on HBO starting at 10:00 p.m. ET.